I finished the oil and filter change at approximately 11:00 am Tuesday morning, about an hour after I’d promised Michael I’d get to his house. There, we loaded our bikes into his truck and headed out to Rogers, Arkansas for the start of the Ozark Mountain Scramble. We had agreed about three weeks earlier to use his truck because it’s a 550 mile haul, the bikes aren’t especially comfortable for interstate cruising, and one of the bikes (mine) hadn’t been sufficiently tested to be considered even vaguely reliable. 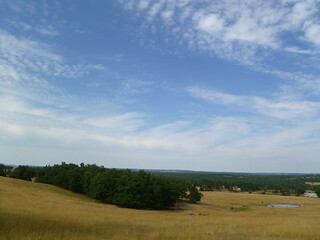 The Scramble was three days of riding the curvy, scenic, and surprisingly clean roads of Arkansas’ northwest quadrant. The Ozarks may not count as mountains by the standards of the American West, but what they lack in altitude they make up for in density of twisting roads that are lightly traveled. One rider crashes his bike about 100 feet front of me, folding his shift lever backwards and causing him to exit the Scramble. He could have continued with some minor welding work at a local garage, but his confidence was lost and he safely opted to catch a truck ride home. Another rider crashes in the same stretch of road, snapping the front brake lever. He finds a replacement in Eureka Springs and continues to finish the Scramble with no further trouble. A shortcut is added to the route, skipping what would have been an important gas stop. Nearly everyone gets worried about running out of gas, and I run completely out of fuel. We transfer two small Gatorade bottles of fuel from Andy’s Honda CB750 to my Kawasaki KZ400, which is enough to get me five miles (off-course) to the nearest gas station, according to a friendly couple who passed by in a pickup truck. The excitement is amplified by their warning that the gas station closes in under 20 minutes. About five miles later, my KZ400 begins to misfire severely going up a mountain. I replace the spark plugs on the shoulder and carry on about two miles before the problem resurfaces. We observe fuel flowing through the clear fuel filter not long after I park it, which suggests a fuel flow problem. Hoping it’s a temporary problem for some dumb reason, I ride it another two miles before the problem comes back, then watch fuel flow through the filter for a much longer time than it should ever take. I reason that while the see-through fuel filter is clean, the fuel petcock’s internal strainer is not. I remove the petcock’s strainer bowl and find it nearly filled with bits of rust and flakes of leftover silicone sealant from a previous owner’s ill-considered repair. After cleaning that up, the bike runs more or less properly for the rest of the Scramble. I’m sure I’ve left out other mechanical hijinks, but I think this backs up my take on the Ozark Mountain Scramble’s theme: worn out old bikes, resuscitated cheaply and made rideable, but not so reliable as to eliminate the surprises and challenges of fixing them on the side of the road and in hotel parking lots.